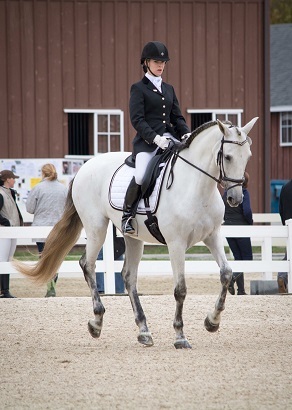 The Dressage Foundation's Renee Isler Dressage Support Fund has awarded a $500 grant to youth rider Amanda Perkowski of Cream Ridge, NJ. Amanda will be using the grant to spend next summer training her seven-year-old Oldenburg gelding, Allegro, with Grand Prix rider Luis Denizard. “I am so grateful for the support of The Dressage Foundation and Renee Isler Fund for giving me this opportunity,” Amanda said. “The experience I will gain training under Luis will help me take the next step in establishing a future career as a dressage trainer. It will also help me achieve my ultimate goal of training Allegro, who is owned by Alexandra Myers, through the FEI Young Riders. Thank you to everyone who makes this Fund possible; you are helping me meet lifelong goals and propelling me forward on my dressage journey. I look forward to being able to contribute to the Renee Isler Fund in the future!"